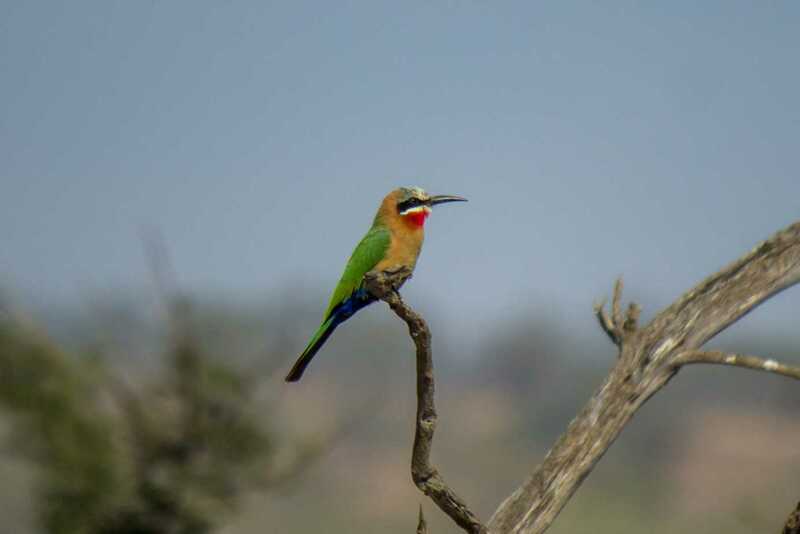 The white-fronted bee-eater (Merops bullockoides) is an African bee-eater species commonly found south of the equator. It reaches a length of 21.5-23.5 cm (8.5-9.5 in). It has a white to dirty white forehead, a black mask through the eyes, a bright red throat, and a distinct white line separating throat from beak and facial mask. Back and wings are green, while neck, top of head, as well as most of the chest and belly is cinnamon. Lower belly and underside of tail is a deep blue. 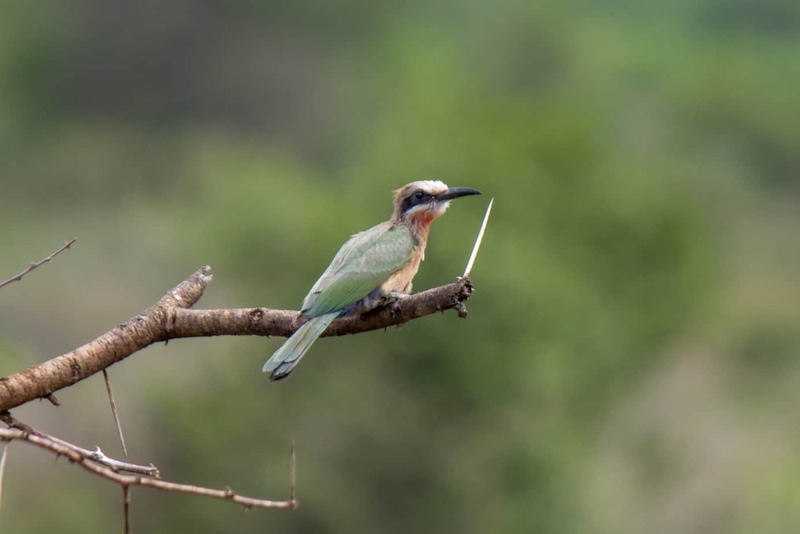 White-fronted bee-eaters prefer open habitat and are often found in savannah regions with a necessary abundance of low trees and bushes for hunting. 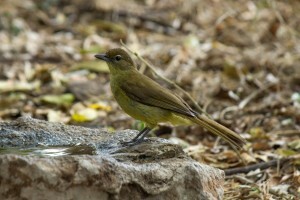 They are also quite often found close to gullies. Diet exclusively consists of insects and one study showed 90% of prey were Hymenoptera (bees, wasps and ants). 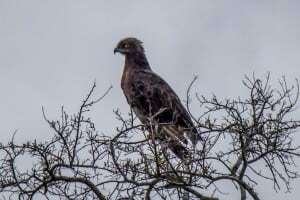 They will often sit perched on an open branch looking for prey. Upon sighting prey it will take off, catch the insect mid-air, before returning to the same branch where it consumes its meal. 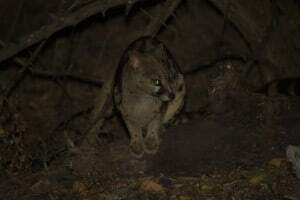 Sometimes they will follow prey to altitudes of several hundred meters. They are also often spotted gliding and hovering before capturing insects below. The white-fronted bee-eater has one of the most complicated and advanced social systems in any bird species. It is a social breeder and will nest, roost and socialize in large colonies averaging 100-200 individuals. When foraging, individuals tend to be more spread out. Within the colony they are split up into groups known as clans. Each of these clans consist of 3-6 families with an average of seven individuals spanning as much as four generations. Although only one pair in each family will breed, other family members will help in the creation of the nest, incubate eggs, feed and rear the young. 50% of all non-breeding individuals in a colony will act as helpers for closely related individuals. 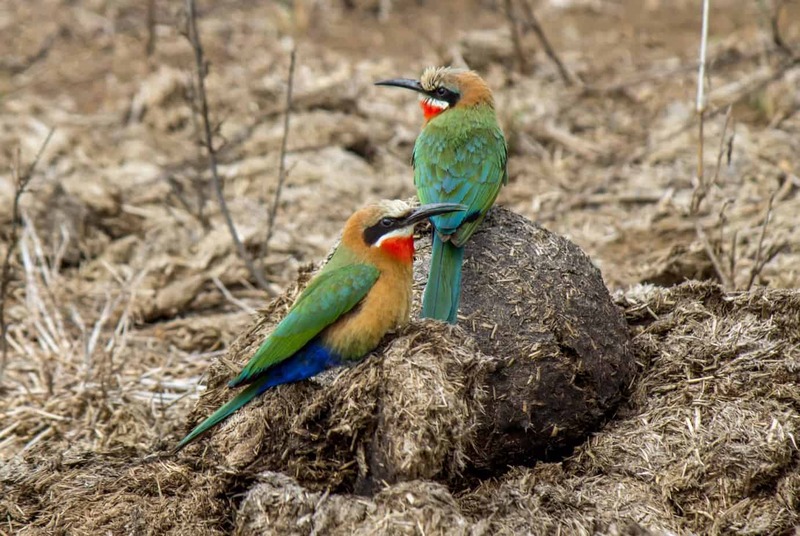 Nests are made by digging small cavities in river banks and gullies, and eggs are laid in the late dry season to early rain season in the period August to November. Two to five eggs are laid in the nest and incubated by both parents and helpers for about 21 days. The chicks leave the nest after 20-28 days and juveniles will either disperse or stay with their parents to remain as helpers for the next breeding season. As many as 9-12% of all chicks born are not related to one or both parents. Breeding females are sometimes pursued, forced to the ground, and raped by unmated males making her lay his eggs instead of eggs related to her mate. Some unpaired females will also go into nests belonging to other pairs and remove their eggs before laying her own. The breeding pair will raise the chicks not knowing they are unrelated. White-fronted bee-eater is common and widespread within suitable habitat throughout its range. 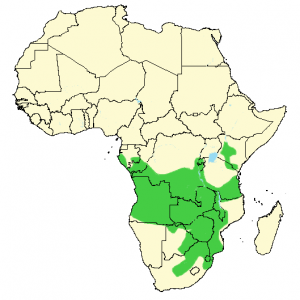 Although the species has seen a recent increase in range and is not threatened, whole colonies will often leave their breeding grounds if human disturbance is too severe. 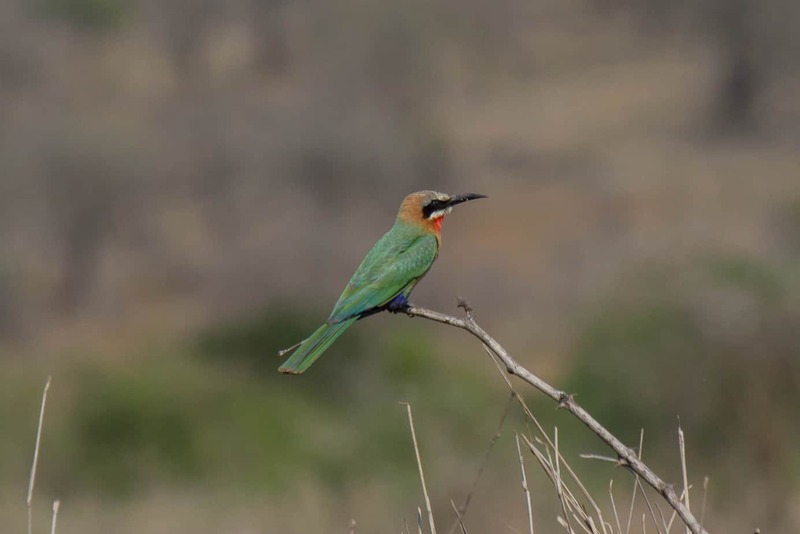 White-fronted bee-eater is listed as least concern on the IUCN Red List.